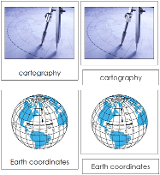 Cartography Nomenclature Cards are formatted in a 3-part card series. This set includes 12 basic concepts of cartography: cartography, globe, map, compass rose, grid system, Earth coordinates, hemispheres, map projections, physical map, political map, road map, and topographic map. Cards with label are approx. 3¾" x 4", cards without label are approx. 1" shorter.